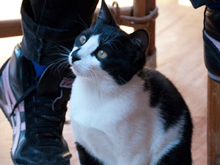 Pet Friendly Restaurants in Nantucket! Get a Groupon Deal on Restaurants for Nantucket! 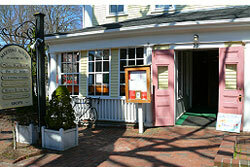 Looking to dine it up in Nantucket and get a discount? 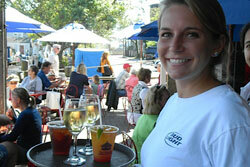 Get a Restaurant Deal Groupon for Nantucket! $$ International & American, Contemporary Cuisine, Breakfast & Brunch, Soup, Gluten free options; Looking for delicious (and we mean DELICIOUS) seafood and more? Come here! The Centre Street Bistro includes breakfast, lunch, and dinner. 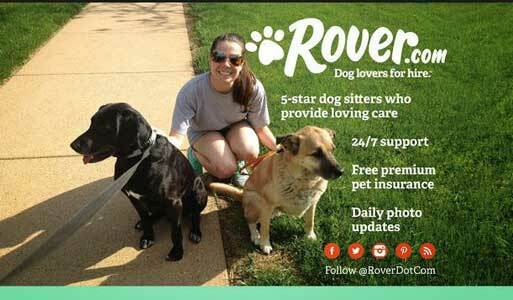 And bring Fido to the patio! Pet friendly brewery in Nantucket! 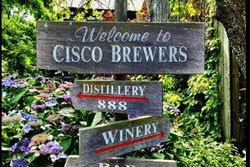 This pet friendly place is a combination brewery, distillery, and vineyard with 3 separate outdoor buildings offering tastings and full-size portions of pale ales, artisanal gin, and small-batch Pinots. In the center, there’s a biergarten-like courtyard where dogs run free, and you can eat and try Notch, a single malt whiskey made from beer and barrel-aged for eight years ($44 for a 1.5-oz. sample, including glass). 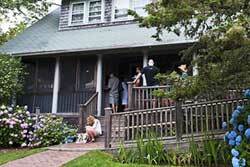 If we came to Nantucket, THIS is the first location we'd visit (with Fido, of course). Picture a winery, brewery, and distillery . . . in ONE location! Woo hoo! $$$ Sushi, Asian, Gluten free options; this pet friendly restaurant is a chic hotspot with a global menu and great cocktails and gourmet burgers; the Patio is petfriendly - what a nice menu, including sushi and sake!. I checked out the menu - Asian flare with beautiful presentation. A very nice meal. 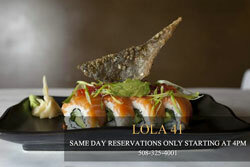 Taste LOLA 41’s best seller—the caramelized onion and Wisconsin cheddar topped Black Angus sirloin patty for $14.95; and—at spin off Lola Burger, a take-out place on Broad Street they serve an excellent traditional lobster roll for $20. Find a seat on the Front Street benches or eat at the docks to watch the ferry crowds roll in. $$ Grocery, Breakfast & Brunck, American, Sandwiches; Come out here to load up on fruits and vegetables! They have outdoor picnic tables that are pet friendly. They have a take-out kitchen that has great seasonal sandwiches and everything is farm-fresh. 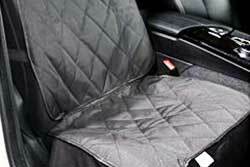 Black & WaterProof: Designed for front passenger seats on all standard vehicles, trucks & SUVs. Made with high quality heavy-duty polyester for durability. Tripled Layered Waterproof PU for Extra Comfortability. $$$ New American, Contemporary, Bar, Gluten free options; this is a cozy restaurant that serves eclectic American food with fresh, seasonal ingredients; there is a pet friendly outdoor deck that is pet friendly; this fun bistro is in the that serves as a nice retreat from the bustle of downtown, heaters and blankets are provided at night; the restaurant is located heart of historic Nantucket, behind the Nantucket Atheneum. 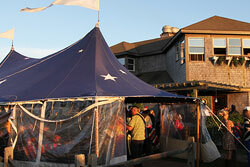 #3 of 107 Restaurants in Nantucket - 165 5-Star Reviews! $$$ Tex-Mex, American, Bar, Seafood; this is a relaxed restaurant with a take-out window, specializing in seafood with Baja-style dishes like fish tacos. "Madaket Millie" Jewett, a Nantucket legend, spent her life caring for the beaches, the animals and the people of Madaket. Reserved, yet strong-minded, Millie embodied the self reliant spirit of native islanders. She was beloved by locals and visitors alike, always willing to help people in need. Millie patrolled the coastline and watched for shipwrecks, earning her the highest civilian rank from the US Coast Guard. Fun menu - lots of seafood. $ American, Cafe; Bakery and takeout. They have outdoor seating. Go for breakfast or lunch and try the bacon and cheddar sandwich with honeycup! $$ Seafood, American, Pub/Bar; Your dog is more than welcome to join you at this family-friendly location! Come grab a burger or delicious salad for dinner or lunch!